← Durham’s Ponysaurus Brewing Co. Expanding Brewery & Adding Taproom! 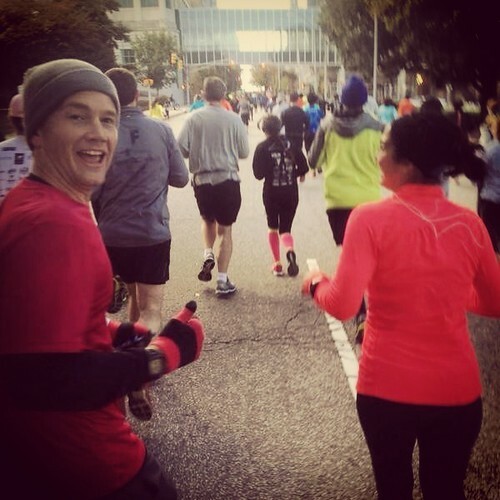 It’s been a little over a month since I raced in the City of Oaks Marathon back in November. I’ve since had time to reflect on this great local race and wanted to share my recap of the event. 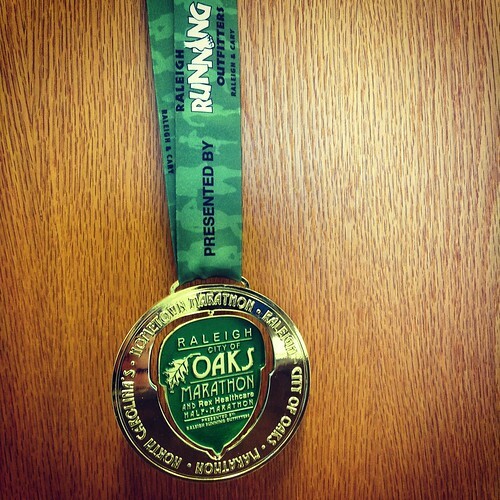 I ran the Oaks marathon last year (my first) and finished with a time of 4 hours and 9 minutes. While I was very proud of that time I came away from the experience knowing that if I trained smarter I could come back and achieve a sub-4 hour finish. 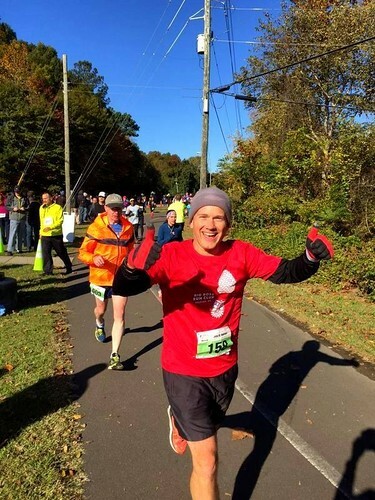 So I spent most of the summer and early fall of 2014 preparing for my 2nd attempt at a full marathon running with friends from the Big Boss and River Run Clubs in Raleigh. I also made a point of running as much of the actual City of Oaks course as possible, including the dreaded House Creek Trail and the monster hill that claims so many victims at mile 23 of the marathon. If you aren’t a fan of race recaps I’ll cut right to the chase, I achieved my goal and finished in 3 hours 58 minutes and 21 seconds! 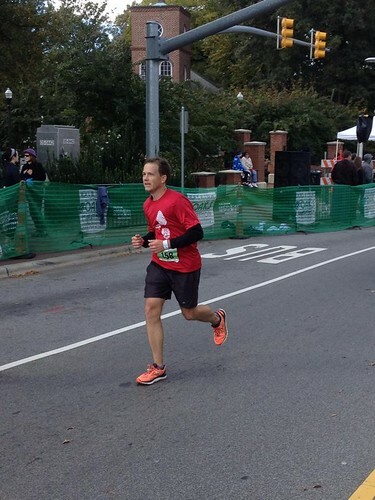 For those of you considering running in this great race, read on for my full race recap. I apologize in advance if it comes off as overly dramatic, but this race meant a lot to me and is my biggest achievement as a runner to date. I hope you enjoy my recap! Race day was a bit cool with temps hovering around 35 degrees at the start, but the weather promised to warm up throughout the morning and the clear skies and low wind made for great conditions for tackling a 26.2 mile run. I thought ahead and started the race with a hat and gloves that I planned to ditch along the way as things warmed up. I also planned to run with the 4 hour pace group to keep me on target for a sub-4 finish. However, right from the start I had a mistake to overcome. I had misjudged the crowd of runners lining up at the start and the time it would take for us to file through the starting chute. I ended up positioning myself too far behind the pace group and once the race had begun found myself crossing the starting line a good 4 minutes behind them. I immediately began to panic and did the one thing I promised I would not do, I ran faster than I had planned in an effort to catch up. I spent the first 4 miles of the race slowly working my way through the pack trying to catch the pace group. It took two miles before I could even spot the pacer with the flag way off on the horizon on Western Boulevard. I finally caught up to them around mile 4.5. I was a bit worried I had spent too much energy catching up to them, but I was comforted by the fact that I now had a 4 minute buffer as long as I stuck with them and was now on track for a sub-4 hour finish. I only needed to stick with them for next 22 miles! The two guys leading the pace group were fantastic. They kept the pace on target maintaining a 9:09 minute/mile pace and shouted out our time at each mile marker letting us now how many seconds we were ahead of pace. It really helped me to run with this group as I knew from past race experiences that it can get pretty lonely out there on the final miles of the course and I needed a rabbit to chase in the event I felt myself slacking off on the pace. Around mile 6 two friends from the River Run Club who were running the half marathon passed me. As they passed it was great to chat for a moment and get an energy boost from seeing some familiar faces out there along the course. Feeling good after seeing my friends, I plugged away with the pace group as we entered the Cameron Village area. This was around mile 8.5 for me but it is also where the 10K (which follows a slightly different course) finishes. As I passed Cameron Village I heard a booming voice yelling my name. It was my friend Todd, the perennial River Run Club “Fan of the Week” shouting to me as he finished strong across the 10K finish line. Once again it was great to receive words of encouragement from a friend along the course and I felt even more confident as I pressed on. 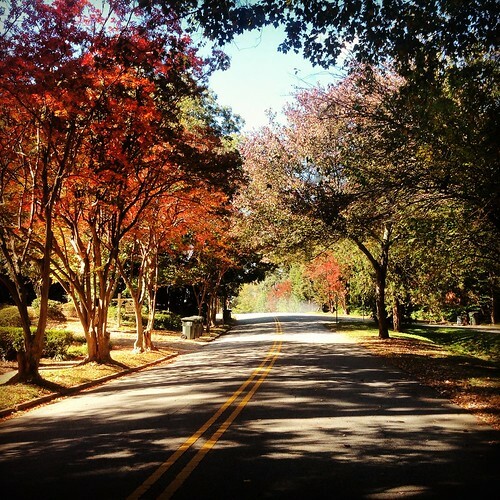 The next three miles of the course took us through the rolling hills of the beautiful Cameron Village neighborhood. Last year these small hills caught me by surprise and sapped me of my strength. Not so this time around as I was physically and mentally prepared having run this section of the course a few times over the past year in preparation. It felt great to run this section with confidence and the course knowledge of what was to come. As we approached the Meredith College Campus at mile 11 the half marathoners split off to finish their last two miles to the finish on Hillsborough Street. 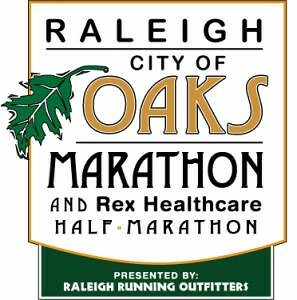 Full marathoners on the other hand entered the campus to spend the next 13 miles of the race on the Raleigh greenway. 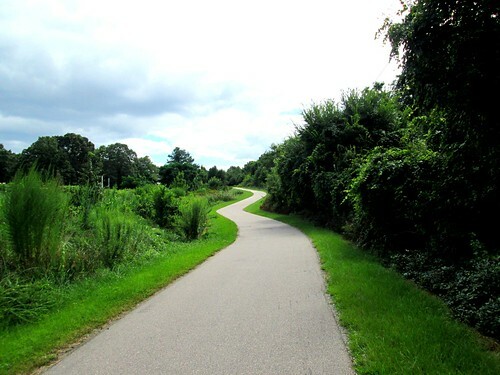 I had run this stretch of greenway from Meredith College to Shelley lake in North Raleigh several times over the summer. As we entered the trail I felt a twinge of panic because my legs were starting to feel a little tired and I knew we had so much further to go. I quickly pushed this out of my mind. 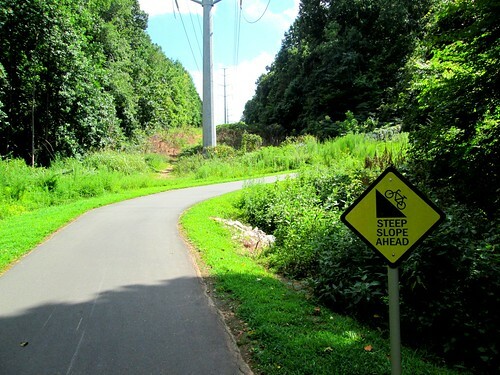 This greenway had been my home during much of my training. I was very familiar with it and I knew what it would take to run it successfully. As we ventured through the forested greenway trail I couldn’t help but take in the sights of the fall foliage. This was my first race not using an ipod and I really enjoyed being more connected with my surroundings and what was going on around me. Some of the runners in out group were chatting, but I knew I needed to conserve my energy and limited my talking to a grunt or two along the way. As we approached mile 15 the greenway briefly opened up to a street and the McDonalds behind Crabtree Valley Mall. This is a popular spot for spectators to cheer on the runners. I was shocked to see my friends Todd and Brian from the River Run Club there cheering on the competitors. As I plugged on past mile 15 I knew the next portion of the race was where I would have to fend off fatigue and tried to keep my head clear and focused on my goal. Thumbs up at mile 15! Sure enough at mile 17 I began to feel the fatigue set in. Unlike last year, this time around i did a better job of hydrating properly and took extra energy gels along the way to make sure I didn’t run out of fuel and hit the wall like I did in 2013. I think ultimately I took 5-6 GUs throughout the race and I would often take two cups of water or one cup of water and one Gatorade at each aid station as we passed. This helped A LOT as I never felt completely depleted of energy. At the turn around at mile 17.5 I put my head down and went to work. I never took my eyes off the back of the pacers. I knew I had the energy to finish. I jut needed to keep my head clear and stick with the pace group. There were a few times between miles 20 and 22 I felt myself slipping several yards behind the pace group. A few times I realized I was the last runner in the pack. Each time I would slowly work my way back to the front. Again, it was great to have that pace rabbit to chase! As we approached mile 22 I heard one of the pacers yell out “This is the hill that will make or break your race!” We all knew what was coming. I had practiced running the House Creek Trail hill at least a dozen times during my training over the summer. I was ready to give it my best shot. As we worked our way up the steep incline I felt my pace slipping and I shortened my stride. I didn’t care that I had fallen to the back of the pack again. I knew I wasn’t going to let this hill beat me. As I methodically worked my way up the steep grade I passed a few runners from our pace group who were now walking. I did my best to utter a word or two of encouragement as I passed them and continued on to the top. Just as I reach the top of the hill around mile 23 my right calf and thigh muscle seized up with the most intense leg cramp I’ve ever experienced. I immediately came to a full stop and began massaging my thigh with both hands. Much to my horror my right foot began to cramp as well! I hobbled forward forward a few steps but the cramping persisted and for a brief moment I thought my race was over. I stopped again and massaged my leg. As I stood there on the side of the trail rubbing my leg it occurred to me that the pace group was long gone. I was all alone on the trail and felt defeated and for the first time that day and felt like giving up. But then I thought about all the preparation I had done, all the weekends logging long runs on this trail and all my talk about achieving a sub-4 finish. I couldn’t end it like this! Thinking about my training and thoughts of giving up when I had come so far triggered a surge of adrenaline that energized me. I muttered a few choice curse words to myself and started running… again albeit a bit more slowly at frst. There was no way I was going to give up now – not when I am only 3 miles from the finish I thought to myself. As I continued to run I started to feel the cramp loosen up after a minute and a minute or two later it had mostly subsided and I was back running at my goal pace. I looked at my watch and knew that If I could just hold it together for these last 3 miles I still might be able to finish in under four hours and achieve my goal. As I continued on along the trail through Meredith College towards the exit on to Hillsborough Street I could still see the the pace group about a quarter mile ahead. I knew I had a 4 minute or so buffer and told myself I just needed to keep them in sight on my way to the finish. I felt a huge sigh of relief when I exited the greenway at mile 24 and started the final 2 mile stretch on Hillsborough street. This part of the course includes a short out and back so I actually saw the pace group running towards me a few minutes later after they made the turn around to head to the finish. The pacers yelled to me. I knew I couldn’t catch them but I locked my eye onto them and mentally anchored myself to them to pull me in to the finish and I felt myself pick up the pace once again. With the pacers a good 1/4 mile ahead of me I made my way down the last mile on Hillsborough Street. I looked at my watch and realized I had 10+ minutes to run this final mile and I would still come in just under 4 hours. I breifly pulled out my ipod thinking it would be good to listen to some music to give me one last surge, but I quickly realized I would rather take in the sight and sounds of that last mile so I put it back in my pocket. I’m really glad I did this because as I approached the final stretch I ran past several of my friends from the River Run Club & Big Boss Run Club and it was great to see them and hear them shout words of encouragement as I approached the finish. In the back of my mind I realized they probably thought I was going to miss my sub-4 goal since they must have seen the h hour pacers come by minutes before without me, but I knew I had it at this point. I got one last burst of energy and put everything I had left into a sprint towards the finish line. As I crossed the finish the clock read something around 4:02 but I stopped my garmin just as I crossed and I knew it told the real story. It read 3:58:24 and was later confirmed by my official chip time of 3:58:21. Mission accomplished! After receiving my dinner plate size finishers medal I hobbled over to my wife and friends to celebrate. I was having a little trouble walking but the elation of finishing the race and knowing I had achieved my sub-4 goal made it all melt away. This day was easily my proudest moment as a runner and it was great to celebrate it with friends. The City of Oaks is a fantastic local race. The course is beautiful, the volunteers are great, and the post race celebration with free food and beer is an awesome plus. 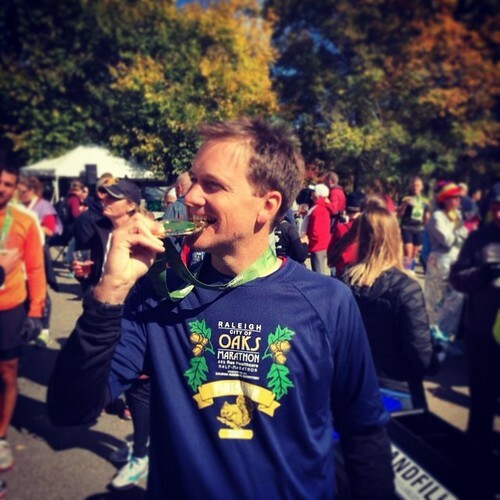 I will be taking a break from running full marathons for a while as I focus on shorter distances in the coming year, but I would highly recommend this race to anyone. 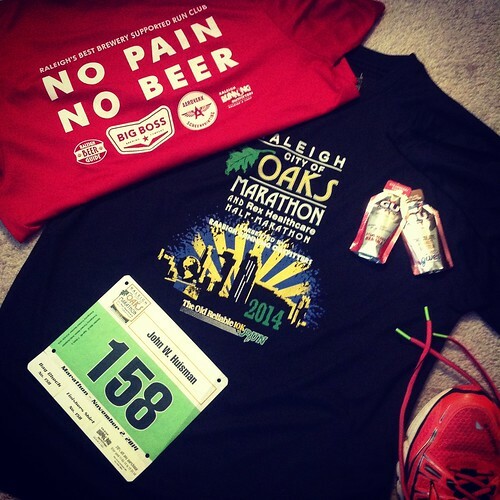 You can learn more about the race and register for the 2015 event by visiting the City of Oaks Marathon website. Before I wrap up this race recap I’d be remiss if I didn’t give a special shout out to my friends and fellow runners at The River Run Club and Big Boss Run Club. Many of whom also ran the City of Oaks Half Marathon and 10K and had great races themselves that day, but were still kind enough to hang out afterwards to support me when I finished. Both of these groups are fantastic local run clubs you should definitely look into if you are looking for fun people to run with. 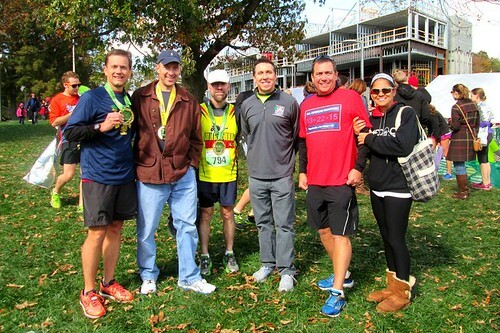 This was my final full marathon (for a while at least) but here’s to another fun year of running great races with good friends in 2015. Happy running!! Well done! Huge achievement! I think I actually see the back of my head, and the back of both of my sons heads in your first photo at the starting line. Too funny! Well done! I did the 10k, as I was running an Ultra relay that next week. I love that race, but those temps were a little cool for me! Great re-cap John! It was so fun to follow your intense training and then see you cross the finish line achieving your goal. Glad I could be a part of your awesome day! Thanks Anj! It was truly awesome seeing you all out there. What a fun day! Cheri – I hear the 10K race is great too. I may consider doing that next year now that I am taking a breather from full marathons for a while! Runner1313 – Thanks! It felt great to achieve my goal. Hopefully I will meet you at one of the local races one day. I enjoyed your recap of running with your two sons!